XL426 and the Vulcan Restoration Trust are the subjects of a four page feature in the September 2017 issue of FlyPast which went on sale on 1 August. 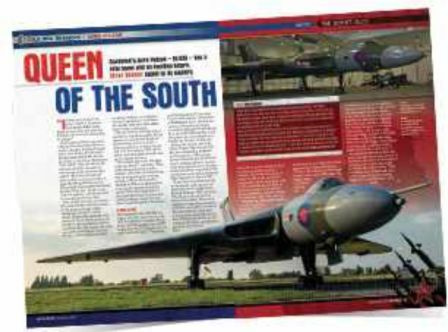 Titled “Queen of the South” the piece was penned by FlyPast Deputy Editor Steve Beebee who visited XL426 in her new home in London Southend Airport’s Hangar 6 on 5 July. Steve interviewed the VRT’s Matt Lawrence, Andy Wagstaff, Peter Archer and Richard Clarkson for the feature, which looks both back at XL426’s time at the airport and forward to what can be achieved now the Southend Vulcan has a home indoors. VRT member Liam Shaw provided some stunning photos to illustrate the feature.